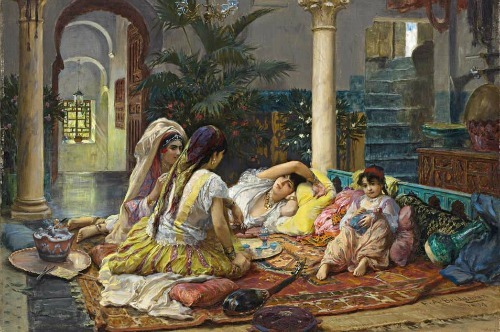 Frederick Arthur Bridgman was an American artist of the late 19th and early 20th centuries who had a passion for North Africa and the Moorish culture. His paintings are filled with buildings and palaces that look like they belong in the Arabian Nights. Through his eyes we discover the Moorish interiors of these homes of the well-to-do in this very different part of the world. When the Arabs conquered North Africa they took over an existing civilization in decline. Before the Arabs Germanic barbarians had come and conquered, but had made no serious additions to the cityscape. Rome had ruled here and Greek and Roman architecture dominated the public buildings and the better homes. 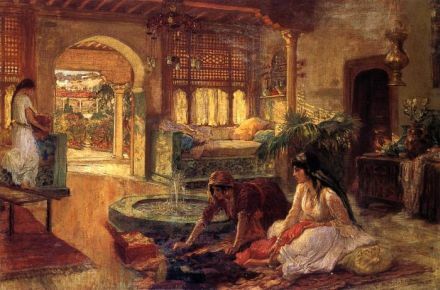 Eleven centuries later when Frederick Arthur Bridgman painted this scene that Classical civilization was still asserting its influence on Moorish interiors. We see this in the Greek columns present in this room, but also in the arched doorways. These are not Roman arches, but this type of arch is a descendant of the Roman arch. The Islamic civilization improved and modified what they found and injected a new cultural vibrancy in all things artistic. The arches you see are a result of that new life breathed into the existing classical forms. The architect of this home used repetition and the gestalt principles of similarity and closure to create a visual pathway for the eye. The arch of the doorway is repeated on the wall and the window. These doorway is not structurally related to the latter arches, but the eye sees them as similar and groups them accordingly. As a result the eye follows the archways down the hall and to the window. It transforms a rather small window into a type of centerpiece. At the window we are introduced to another characteristic of Islamic architecture, the use of abstract geometric patterns as a decorative element. Islam shunned the depiction of any living thing. To fill the void they created all kinds of abstract patterns. This reliance on the abstract graphical forms proved very effective when it came to architectural decoration. The window is not only framed beautifully it becomes a view in itself. The doorway and hallway not only direct our view toward the window they restrict our view so that we can only catch it from certain angles. This is an example of what architect Christopher Alexander calls a "Zen View" (pattern #134). 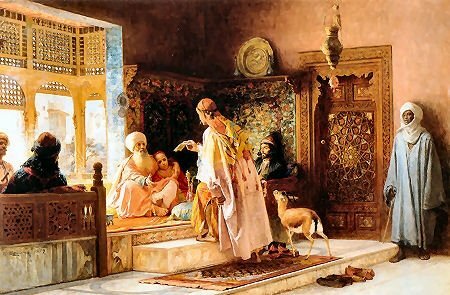 In this scene we are introduced to several new elements of Moorish interiors. The windows are screened with carved lattice work. In earlier times glass did not exist or was rare and the lattice served as a way of letting air and light in while preventing outside eyes from peering in. The lattice could be decorative as well as functional and in the Islamic culture were often formed with intricate geometric patterns. In the foreground and to the right we have an interior fountain. In North Africa, as in much of the Islamic world, the climate was generally dry and hot. The wealthy would incorporate flowing water into their buildings as a source of cooling. Sometimes this was in an open courtyard, but here it appears to be in an enclosed room, judging by he darkness. As in the first picture furniture is nearly absent, but a wealth of pillows and rugs provide a lounging area. This lounging area is elevated and it appears that there is another elevation beyond the people lounging. This offers a kind of separation of different areas. In a fairly large room it creates an opportunity for intimacy. This painting incorporates many of the same things we have seen before. There is a fountain, Greek columns, an arch and lattic screens. This has been a very quick inside look at North African homes of the 19th Century, courtesy of one man. 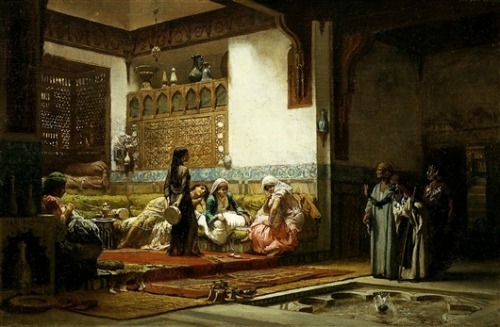 There is something very appealing about the Moorish interiors that he presents to us. All of these rooms have a certain openness to them. They are large, with much open area and little furniture and yet very social. In some cases the architecture helps to create this. The different elevations allow for some division of the space, creating smaller areas within a larger area. In other cases it appears to be solely a function of the rugs and pillows creating a tight social grouping. In a world where houses are stuffed full of couches and chairs and tables, perhaps a simpler approach is worth considering.